Go offsite, Picking up a car at the airport can cost you from $80 to $200 more depending on the length of the rental. I use Hertz or Enterprise rental cars in Puerto Rico. Last time I saved $225 by renting from Enterprise and picking the car up at the Ritz Carlton in Isla Verde. I went to the taxi stand asked for a taxi to the Ritz was told it was $12. I was there in five minutes, picked up my car drove back picked up the family and we were off. My wife and son picked up the checked luggage and waited for me outside. The trip cost me $15 with tip and saved me $210. Same thing on the trip home; dropped the family to check bags dropped the car, got a taxi back for another $15 so actual saving were $195 which is a great deal! Clear the cookies, I am a loyalty member to several rental car companies for the weekly discount codes by email and ease of renting. When renting online you need to clear your cookies before starting your search… Because sometimes the prices quoted are higher, regardless of the fact that I am logged in as a loyalty member. To prevent this from happening, you can clear the cookies on your Internet browser. This way, the rental car site will think it’s your first visit and will offer you a better deal. 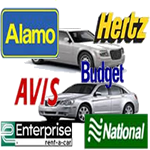 All great information to save you money on your next vacation rental car. You can combine these to save you even more money. Sometimes if you clear your cookies and search for offsite get your price for selected car and then edit the itinerary to SJU to pick up at airport you may be surprised to get a reduced price. I like Hertz because I am a gold member so I just give the driver my name (picking up at airport) he gives me the parking spot number my reserved car is in. I load up the car get my rental papers from inside do a walk around to note any damage, scrapes, dings take out my license and head to the gate for check-out. Quick simple easy process of about 15 minutes to clear the lot. Doing an offsite with Hertz I would pick up in Condado. Ashford ave. which is about $19 by taxi. I go with the cheaper deal from the top rental companies for the best deals on clean new vehicles'. Picking up at the Ritz, Condado or SJU has always netted me clean cars! 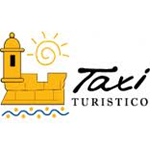 A great site for Taxi fares in Puerto Rico is, TaxiFareFinder.com. To save on your rental accommodations in Puerto Rico; just give us a call at Villas de Costa Mar for the best pricing. Call-ins ready to book will always get the best pricing with us. We are here to answer all your questions so there are no surprises other than safe, clean, comfortable, secure accommodations across the road from Dorado beach. Visit our website for more information and give us a call when you are ready. Villas de Costa Mar, Puerto Rico Vacation Rentals. Safe travels to all who visit! Your family and you deserve it! Secrets of Puerto Rico in Videos! 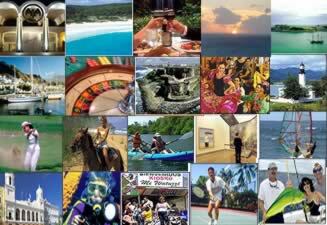 Great collection of videos to see and learn what Puerto Rico has to offer. A few secrets that not many know about Puerto Rico. Ocean, caves, adventures, beaches, culture all on 100 mile by 35 mile Paradise Island. Follow the URLs' to view the videos and see for yourself what you are missing. Something for everyone! Villas de Costa Mar vacation rentals will be your home away from home and your base to rest, relax and prepare for the adventures of tomorrow. Call us today and let’s get you on the calendar so you and your family can enjoy life while enjoying all Puerto Rico has the offer! Our phone number is on our website or just click the reservation inquiry and we will contact you! Enjoy the videos, plan your trip and book with us for clean, safe, comfortable accommodations across the road from Dorado beach! Great Deal not Cheap Deal! It is becoming more and more common that we get last minute calls from guest that inquired about our vacation rental accommodations and did not rent with us. They have arrived at that cheaper rental accommodation they booked only to discover that it does not meet their expectations! We ask everyone to check testimonials, pictures and ask questions when inquiring about accommodations in Dorado Puerto Rico. This should be the same for anyone inquiring about accommodations anywhere. You get what you pay for and the cheapest price is not always the best deal. A clean, safe, comfortable accommodation with a focus on client service is what we offer all visitors who stay at our vacation rental home. It is happening more and more each year especially in the last two years. We communicate with the inquiring guest, answer all their questions and they find something for a lower price and book it. We always say “keep our information for any future visits or if you arrive at the booked rental and are not happy you can call us and if we have availability we will try to accommodate your needs”. It’s not always a possibility and we hate to turn them away but it has happened. So in an effort to prevent these we always say check, check, and check. Check to make sure they have testimonials; not only on their site but also on the big listing sites! The more listing sites they are on the more money they are spending to market their accommodations and service which means they care. Ask questions and never deal with anyone who will only deal with you via emails. They should pick up the phone and qualify you as a legitimate renter and answer any questions you have to ask them. We always call because we care who stays in our home! We have discovered that people who stay and take good care of our home are our best resource for marketing as the people they recommend also take care of the place also. Never pay a vacation rental via western union as said funds are untraceable and you are guaranteed to arrival at someone’s home that has no idea who you are and has never rented to anyone. It happens; be smart and make sure you are getting a Great Deal! Clean, Safe, Comfortable accommodations with Great Service, Not a Cheap Deal! 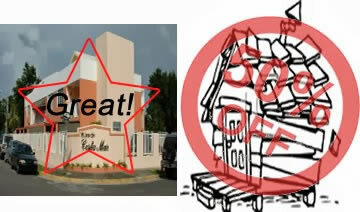 Villas de Costa Mar Vacation Rentals GREAT DEAL in Dorado Puerto Rico! No matter where in the world you are you can never forget that feeling of being back home! What is it; the comfort of sleeping in your own bed, feeling safe, having the room to stretch out and relax. We cannot give you that feeling but we can come closer than if you stayed in that cramp hotel room with doors slamming all night. Close your eyes and think… You just got back into your vacation rental from an exciting day of adventure and you just want to kick back and relax. So let’s stay in tonight throw a few burgers or your favorite on the grill on your rooftop terrace, have a few drinks and watch the sunset. Cool Ocean breezes, great sunset, family, friends a few drinks some music; and you know you made the right choice! You can wake the next morning brew some coffee, sit outside on the balcony, feel the morning sun on your skin and breezes coming off the ocean let you know you made the right choice! We all need to have our adventures in life weather its bungee jumping, water skies, horseback riding, exploring the rain forest or just a nice quite day at the beach or shopping. We deserve to rest our minds, re-energize our bodies and feed our souls. This is what you have worked all year to achieve; a few days or weeks of sun and fun in your paradise vacation setting with all the comforts of home; lets you know you made the right choice! During your visit here you start to get that same feeling when you arrive back to your vacation rental unit, you are home! Not back home to the comforts you know and are so familiar with during your busy lives. But back home to your new comfortable, safe and secure resting place with all the comforts of home. This is it during your vacation adventure each night when you finally arrive back at your vacation rental you know you made the right choice! Give us a call today or click the "Reservation inquiry" and let’s get you and your family down here to recharge your bodies, relax your minds and explore paradise! Your family and you deserve it! Make the right choice with Villas de Costa Mar in Dorado, Puerto Rico. Your Best choice for vacation rental accommodations in Dorado Puerto Rico! Get that safe comfortable feeling of being back to the comforts of home in a paradise setting, make the right choice! Call us: 302-598-1386 EST for best pricing, inquiries only no marketing calls! 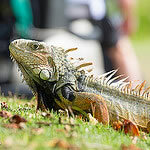 We discovered them on our last trip to our beachfront vacation home (Villas de Costa Mar) in Dorado, Puerto Rico. On day two of our arrival we walked across the street to the beach as we often due; Nelly my son and I. We walked east towards the Embassy Suites to the coral ridge to see the fish and other creatures that get caught in the ridges and wholes when the waves come in and out over the coral rocks. You should always wear beach shoes or some foot ware as the coral rock is very Sharpe and slippery along the ridge were wet green algee forms. We then went west past the fishing village, boat launch docks, Villas de Costa Mar and food/activities kiosks. We noticed a few things on our walk; the sand in Dorado beach is very course and it does get very crowded on weekends when the locals take to the beach. As we walked west along the beach the sand’s texture turned very fine and lighter color. The crowds were reduced and there was plenty of beach space to our delight. We found a lot of great places to sit and relax under palm trees but you better get there early; a plus to those staying close to the beach! As we walked west we could see the sail boats, very colorful surfing kites, paddle boats and other water activities. We walked into the goodwinds front desk and they were very helpful in answering all our questions as to what water activities they provided and gear available for rent and sell. goodwinds, is a family owned watersports management company operating since 2001. Formerly known as KitesurfPR, Goodwinds, started as a Mom & Pop kitesurfing school in San Juan in 2001 and now they are proud to offer the best watersports instruction and experiences in Puerto Rico, in the exclusive Dorado Beach Resort. Since 2001. Best time to visit Puerto Rico? In my day to day interactions with friends, family and people I meet this question always comes up when they hear about our vacation rentals in Puerto Rico. The question usually goes like this. That is great you have property on the island, what is the best time to visit. Not an easy question to answer since it is different for everyone depending on your likes, interest and life style. We love to spend the Christmas holidays in Puerto Rico and it is our best time to visit. But it is not always possible and it is our busiest time for the rentals as Puerto Ricans flock to the island during Christmas holiday season to enjoy them with family. You really need to plan a Christmas trip early in the year starting in June/July and not any later. The reason for this is that all travel related prices will go up the later you make your travel plans; example is a round trip airline from PHL to SJU is about $450 if purchased in June/July and the same seat in Nov/December is about $950 or higher. Same goes for car rentals and housing accommodations. January/Enero: Ok back to the question at hand; what is the best time to visit the island? What are you interested in will be the question to answer the question. January is still Christmas time in Puerto Rico at least until January 06; Dia de los Reyes (three Kings Day). There are two other reasons to spend January on the island. First is Juana Diaz; home of the traveling three kings who wander around the island celebrating the voyage of the Reyes Magos before returning to their home town. Second is Old San Juan which has a wonderful parade where you can take the kids to the Governor’s Mansion in La Fortaleza to get gifts. There are other festivals, Ceiba host a children’s festival on the 7th. Jan 15-18 Fiesta de San Sebastian in Old San Juan’s farewell parade to the Christmas season. And Whale washing season gets underway in Rincón. February/Febrero: Ponce Carnival, the region's preeminent classical music festival in the Caribbean. Feb 01: The Harlem Globetrotters bring their unique brand of basketball to the Coliseum with their Fans Rule World Tour. Feb 6-8: Dubbed the "Best Half Marathon in the World." the San Blas Half Marathon brings athletes from around the world and an expected 250,000 spectators to Coamo. Feb 8-9: If you're a fan of equestrian events, don't miss the 25th Annual Felix Santiago International Championship in Ponce, and catch the majesty and pageantry of paso fino horses. Feb 12-16: Think you're a daredevil? How would you stack up against these guys? Launching from Arecibo, Xtreme launches its annual freefall festival just before Valentine's Day. Feb 14: Valentine's Day is quite popular on the island. Check my blog for special deals and dinner offers at hotels and restaurants. Or you can catch über-crooner Enrique Iglesias at the Coliseum. Feb 15-16: Puerto Rico's first Circo Fest, or International Circus & Street Performers of Puerto Rico Festival, comes to Old San Juan's San Francisco Street. Admission is whatever you feel is worth it for the performance. March/Marzo: Great month for sports and music lovers; Surfing, Golf, Iron men and classical music festival just to name a few of the events in March. Through March 15: The internationally renowned Casals Festival continues into March, and you can still buy tickets to see outstanding artists like pianist André Watts, cellist Amit Peled and pianist Noreen Polera, among others. Events will be held at the Luis A. Ferré Performing Arts Center in San Juan. March 1: Rums of Puerto Rico hosts the 5th annual A Taste of Rum along Old San Juan's Paseo de La Princesa. Spend the day strolling along this pedestrian-only promenade beneath the walls of the old city and sampling the island's favorite liquor, along with local food and live music. March 6-9: Golf's rising stars take on the seasoned pros at the Puerto Rico Open, which takes place at the Trump International Golf Club; it's been voted the most fan-friendly event in the PGA Tour, so you can expect a great turnout. March 8: Jerry Seinfeld, the man who made something about nothing into something spectacular, brings his stand-up act to the Coliseo de Puerto Rico. March 8-9: The 25th edition of the Corona Extra Pro Surf Circuit kicks off with a 2-day contest at Domes Beach in Rincón. A $12,000 purse is up for grabs for the women's competition, and a $25,000 purse will be handed out to the men. March 14: Rock band Paramore perform with Tegan and Sara for one night at the Coliseo de Puerto Rico. March 15: Sangriafest, Puerto Rico's only sangria festival, is back for its 5th year at the Puerto Rico Convention Center. It's a great chance to sample sangrias from all over the world. March 20-23: The annual Heineken Jazz Festival is one of the most important musical events in the Caribbean, and draws global talent to the Tito Puente Amphitheater in San Juan. March 22: Coors Light Soundfields presents an evening of electronica with acts like Empire of the Sun, Rusko and DVBBS performing at Old San Juan's Pier 15. March: This is the start of turtle-watching season in Culebra, a big deal on the island. It is strictly monitored so that nesting turtles are protected, but there are excursions available. One good resource for more information and tours is the Mamacitas Guesthouse turtle-watching program. So yeah there is plenty for the sports and music lover in March! With the mention of what is happing in Puerto Rico in the first three months of the year I guess you get the idea as to what would be the best time for you to visit. There is always plenty to see and do; it’s just a matter of when you can get away and what is happening when you do arrive. We all need a to pack a bag and get away from the day to day grind of work, school and our home surroundings to rest, energize our bodies, mind and soul. Any time you turn and ask your family or friends if they would like to spend a week or more in beautiful, tropical paradise that is Puerto Rico the answer will usually be yes. Your family and you Deserve It! For great clean, safe, comfortable and secure accommodations across the road from the beach; visit Villasde Costa Mar Vacation Rentals or just give us a call to get your questions answered and start talking about your trip. You know what you like and when you can get away and where to stay so calendar of events to plan and call to us for accommodations that a plane ticket, rental car to start your vacation in our little piece of paradise! We await your call and look forward to servicing your accommodation needs! A question came up the other day; a couple wanted to know what the taxi fare would be from Dorado’s Embassy Suites to and from the SJU airport in Isla Verde? They were staying a few nights before getting on a cruise. This question keeps coming up when we speak to our inquiring guest for accommodations also. Please use Taxi stands at airports and hotels for upfront fair to your destinations. Ask for taxi and they will provide you with a form with destination price. The price is about $60 plus gas surcharge and $1.00 per bag. Our suggestion is “it’s cheaper to rent a car”; which will offers you the connivance to *move around and not be stuck in the hotel for the length of your stay. You are also on your own time schedule and not waiting around for a taxi to arrive wondering if you are going to be on time. Most rental cars are cheaper than a taxi especially the further you are from the airports. The taxi’s round trip fair will be $120 plus; so a rental car may be cheaper. A taxi to Rincon from SJU airport which is further out will cost about $200. Read our “Travel Money Savings Tips” to save on car rentals and airfare. The only place you can get away with just taking taxis is in Old San Juan where you can walk to most places and taxis are not too expensive for the further away attractions within Old San Juan. But you will of cause not get to visit the far away attractions and those will require a car so then staying in San Juan is not the best as a lot of places do not have parking. 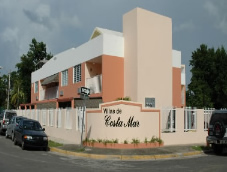 Our accommodations offer you off-street parking with every rental; you get an assigned parking spot in a gated safe complex which is Villas de Costa Mar. Puerto Rico: The Puerto Rico State Agency for Emergency and Disaster Management in your area can be found at the following website: www.aemead.pr.gov. With Hurricane Season upon us we have some emergency information to share; see Emergency Information tab above in articles section.